The last time Tonga Football hosted this kind of championship was fifteen years ago and Haápai was included. There are eight teams registered for this championship and four men’s team and four women’s team. There are four teams from Tongatapu and Vavaú also prepared four teams. These teams are known as, Vahe Tongatapu Kolo (Women), Vahe Tongatapu Kolo (Men), Vahe Tongatapu Úta (Women), Vahe Tongatapu Uta (Men), Vahe Vavaú Kolo (Women), Vahe Vavaú Kolo (Men), Vahe Vavaú Úta (Women) and Vahe Vavaú Úta (Men). 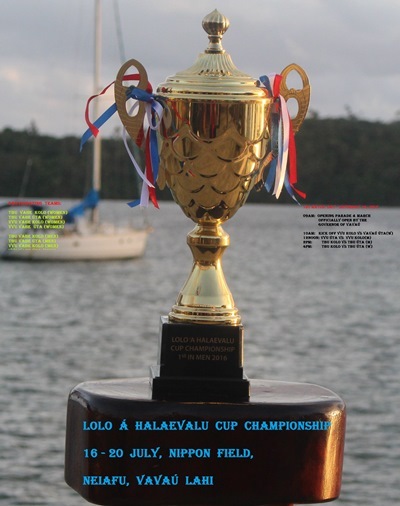 The Lolo Á Halaevalu Cup Championship will conclude on Wednesday 20th July 2016.